This is the week after gamescom, and as is tradition, I have some numbers to share about the event. I will reference data from previous years (some slightly adjusted), as this exercise has been done now for 2014, 2015 and 2016. As for the last 3 years in a row, the dates have changed, with gamescom roughly a week later than the previous year. Moreover, it now starts on Tuesday instead of Wednesday, and ends on the Saturday rather than the Sunday. For professionals (at least the ones coming from Europe), it has the advantage of covering the work week, you can easily be back home on Friday. Microsoft kind-of had a press event? It was more similar to the Nintendo Direct format, with no onsite event, just a live video event being streamed. For reference, the last time Sony had a press event at gamescom was in 2014; while Microsoft skipped last year. The Microsoft event seemed very weak to me. They only announced one new game for Xbox, Jurassic World Evolution, and it is not a very strong fit for a console genre-wise. They actually held their best game announcement for the following day, revealing a new Age of Empires is coming. The limited Scorpio edition also got decent coverage, but it seems to me it is more a sign of how light the event was in content. 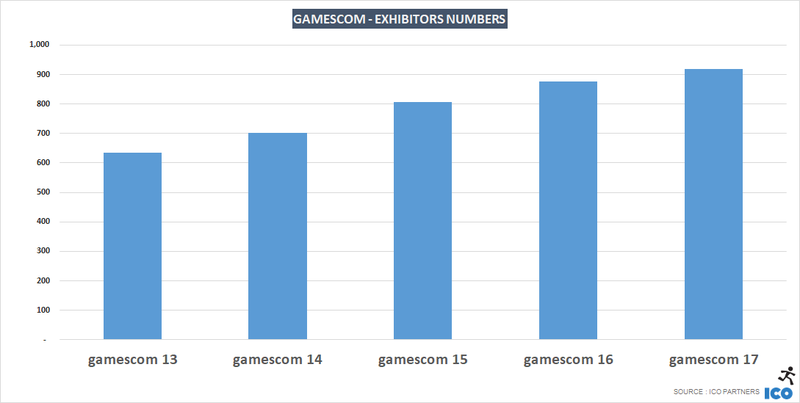 I went and pulled the attendance numbers from the previous years, to see how gamescom is doing in that regard. You can find the 2017 numbers here. 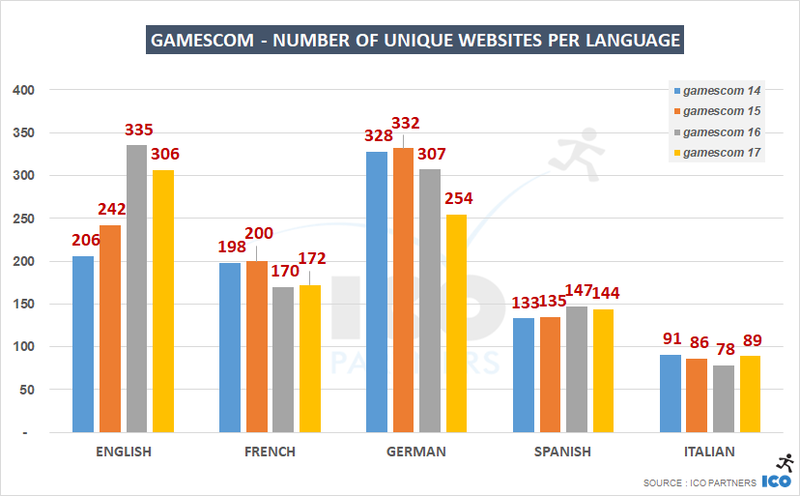 gamescom is not growing much. It seems to have reach its critical mass a few years ago now. I was wondering if the change of dates, especially not having the Sunday anymore, would impact the attendance numbers negatively, but it seemingly had no effect, or it might have even helped that slight growth in attendance. Trade visitors is also very stable, even if lower than the peak seen in 2015. 30,000 professionals attending is quite impressive, it has to be said. The number of exhibitors though is ever increasing. The multiplication of smaller companies (indie studios; micro publishers; other vendors) is probably at play here. This year’s edition of gamescom was relatively underwhelming when it comes to strong media beats (new games; high profile announcements; trailers on high expectation games) – and the media coverage would reflect this. 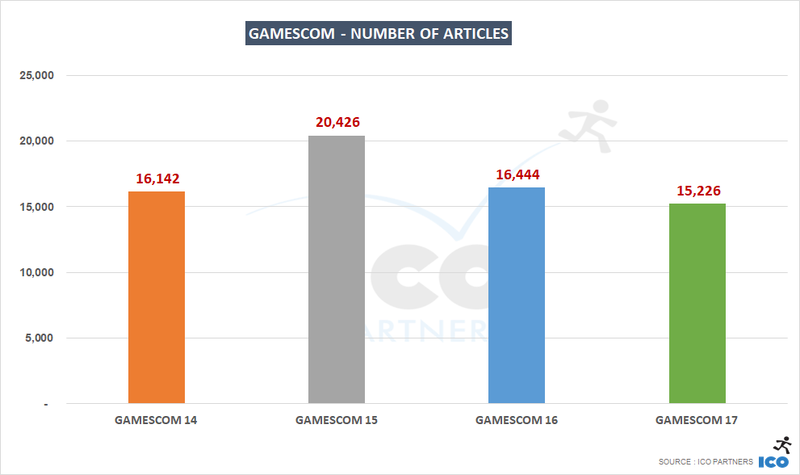 gamescom 2017 has seen the worse performance where media coverage is concerned since I started tracking it in 2014. 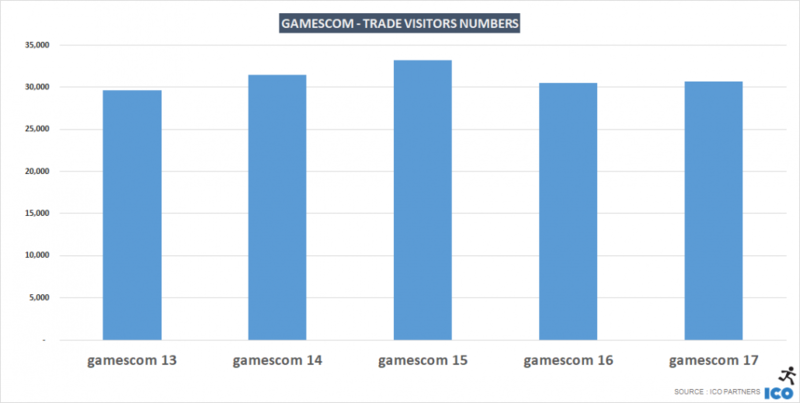 Arguably, the numbers stay in the same range as the ones of 2014 and 2016, but it seems like on one hand Microsoft didn’t put any real show with its media event; while on the other hand no one picked up on the opportunity that gamescom represents. 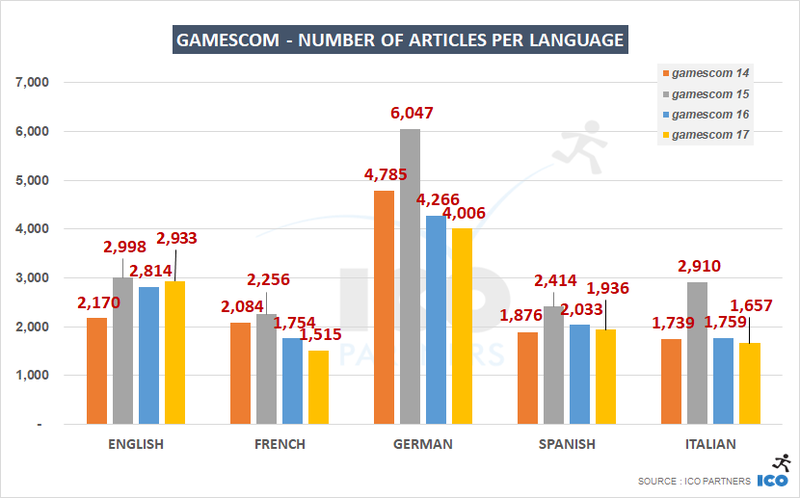 Looking at the volume of media coverage per languages, it is interesting to see the past trend of increased visibility of the event with English media continues. The drop of German coverage (both in volume of articles and number of media) is intriguing and might be the results of a shift in the German media landscape. With Xbox having an extra dedicated event, it should not be surprising that it secured more coverage during the week of gamescom, regardless of how weak the announcements there were. Xbox One X is getting a lot of attention as the newest hardware to be available, and the games supporting it got their fair bit of coverage. 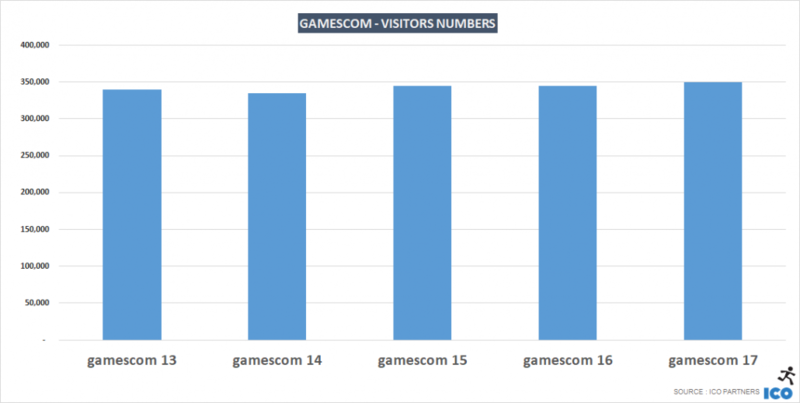 Despite 2017 being weak overall, it is the best gamescom for Xbox since I started tracking media exposure. I find it very interesting that at the Cologne Messe, in the public area, the Xbox booth was actually quite small again. Microsoft seems to be careful with their spending there, at least for the second year in a row. Both Nintendo and Sony had vastly larger spaces, but even major publishers, or game studios had more space. It seemed to me that the Farming Simulator’s booth was only a third of Xbox’. And the Wargaming booth, also in the same hall, was probably twice as big. Despite this being a good year, I can’t help and wonder how much it could have been for Microsoft with a stronger line-up of reveals considering their performance with their half-hearted presence. 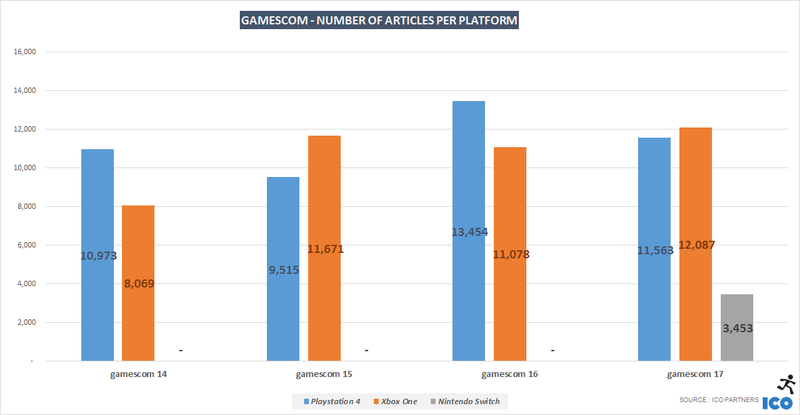 Rather than compare the media performance of the Switch to the PlayStation 4 or the Xbox One, I found it much more interesting to present it compared to the Wii and Wii U coverage of previous years. Like at E3, Nintendo is really ramping compared to during the Wii era. This weeks Showcase was also very interesting on the indie front, and should contribute to Nintendo media coverage growth. Games in orange were the ones first announced during this gamescom (arguably, Biomutant leaked a few days earlier). Final Fantasy XV had multiple announcements that week, taking it to the lead in coverage. Interestingly, it was also a top game last year. Overwatch is still very strong in the media. Blizzard is quite careful about always having announcements to make during gamescom, and it is paying off. Playerunknown’s Battlegrounds took a while to build its media presence. The Xbox One port is certainly helping, but the general strong interest in the title is putting it firmly on the list of media darlings, in a similar way to Rocket League. 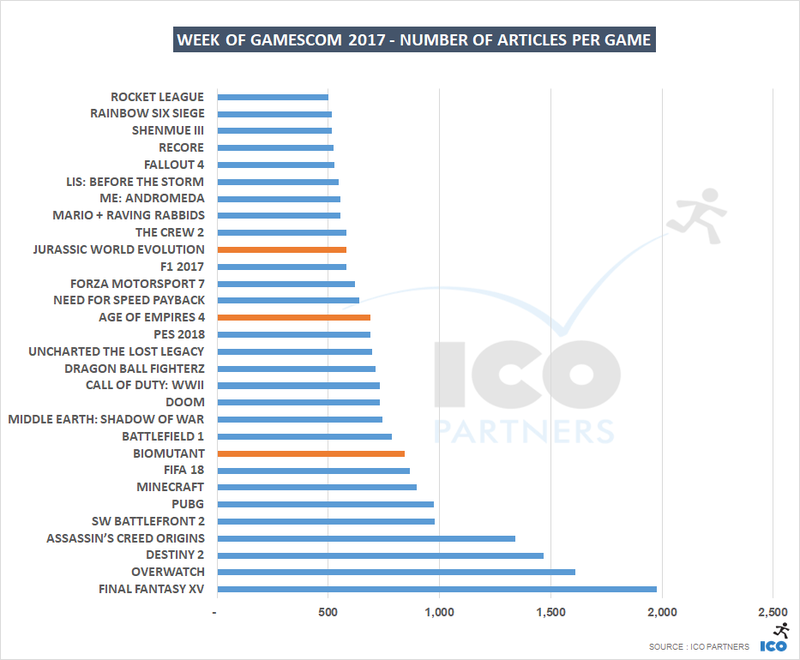 Biomutant’s strong media presence is proving that gamescom is an excellent opportunity for publishers with less muscle than the publishing powerhouses using E3 as their main media event of the year. Jurassic World Evolution and Age of Empires IV, the two new titles announced by Microsoft, secured a significant amount of coverage, but nothing actually crazy. Most of Microsoft media coverage was around the titles supporting the new Xbox One X, rather new games. Next year, gamescom’s dates are for once not changing. They keep the Tuesday to Saturday formula, at the end of August. It will be interesting to see if more companies decide to use it as a springboard to announce new titles, following the steps of THQ Nordic’s Biomutant.